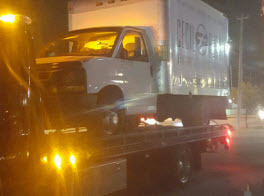 At Citywide Towing our courteous and experienced service providers are available 24 hours a day, seven days a week to take care of your towing emergency requirements. We can get your vehicle safely towed to your home or the auto repair shop of your choice. We understand the need to provide prompt efficient emergency service when you need it the most. Our skilled drivers and technicians use the most up-to-date and well maintained towing equipment and vehicles available to provide you with premium services at affordable price points. At Citywide Towing we provide professional dolly towing services to take care of your front-wheel drive vehicle towing requirements. Our knowledgeable towing technicians will expertly hook the two front wheels of your vehicle onto the trailer while the two back wheels stay firmly on the ground. At Citywide Towing we provide flatbed towing services to take care of your 4 wheel drive and heavy machinery towing requirements. Our well maintained tow trucks are fitted with a flatbed that can be hydraulically inclined and moved to ground level, to allow your vehicle ease of access. If your vehicle is badly damaged in an accident we can use a winch too safely and securely load your vehicle. 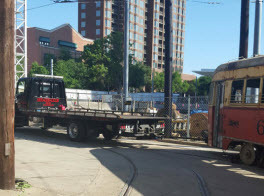 At Citywide Towing we also maintain a fleet of low clearance tow trucks that can easily access and maneuver parking garages and other low clearance areas. Low clearance towing is ideal for cars, SUV’s and small trucks. 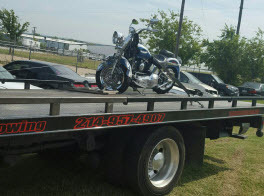 At Citywide Towing we provide affordable and secure motorcycle towing services. Our trucks are equipped with specially designed motorcycle dollies that will ensure your motorcycle is transported safely. Our experienced towing technicians and service providers have experience towing all makes and models. This makes Citywide Towing your best choice for motorcycle towing in Dallas County and surrounding areas! When you need a towing service that can safely handle heavy duty vehicles, you need look no further than the experts at Citywide Towing. Our heavy duty towing equipment and experienced and highly trained service providers and technicians can move your Diesel trucks, motor homes, RV’s and commercial vehicles safely and securely. 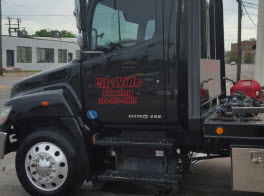 Don’t settle for less – if you need 24/7 emergency towing services, Heavy Duty towing, Medium Duty Towing, Car & Truck Towing, Motorcycle Towing, Local & Long Distance Towing, Lockout Services, Roadside assistance and more in Dallas County, Texas, contact the knowledgeable experts at Citywide Towing today! © 2017 City Wide Towing Service. All rights reserved.